I've been missing those darn pelicans so much that I went archive diving. Not that it would surprise any of you, but one thing lead to another and 6 hours later, I had two new editing programs added to my Mac. available for sickies like me? I used both of these new editing programs on the FIRST photo. I began with Snapseed which can be used on your computers as well as on an iPad and iPhone. I haven't tried it out yet on my iPad but love using it on my computer. I watched a YouTube video which gave me some instructions on all that it can do. Pretty awesome! The only thing it couldn't do on that FIRST photo was add my copyright so I used a new program called Pixelmator, similar editing software as Photoshop but, as I'm told, more user friendly. I haven't even begun to master that yet but hope to someday. Maybe I'll just have to break down and learn Photoshop. Ugh! All the photos aside from the First photo ended up being straight out of the camera except for some cropping. I had my camera set on the P mode and used my Nikon 70-300mm lens. They all seemed somewhat cartoonish but I love the look. Probably couldn't recreate it if I tried! Hope your week has gotten off to a great start. I still had some light at 6:15 last night when I went out to start the grill. Hot damn! Spring is on the way! OH HOW WE LOVE IT WHEN YOU GO ARCHIVE DIVING. Absolutely magnificent pictures. It is staying light just a little later....means my chickens stay up a little longer and I have to wait for them. You're grilling? Can we grill when I come to visit? I never get to grill! i'm totally giggling from that comment after ~sigh~! Okay, that was funny. One simple task that led on into 6 hours and downloading two new programs. So much like my wife. To quote Bob Dylan, "Just like a woman". Me? I strive so hard just to keep things simple. 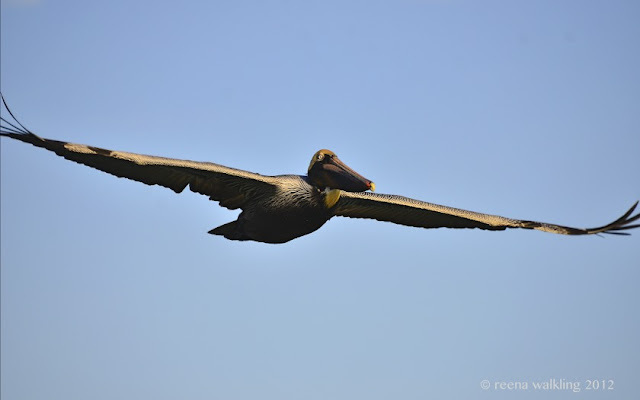 Anyway, ya gotta love those goofy Pelicans who are so graceful in flight. Awesome! I have never seen one in flight. They are not nearly as awkward looking in the air. It's great fun Reena messing around with editing techniques and camera settings - I love your effects on the pelican on a post. You do a great job with your pictures..... keep digging!! Love those shots, Reena! Nicely done! 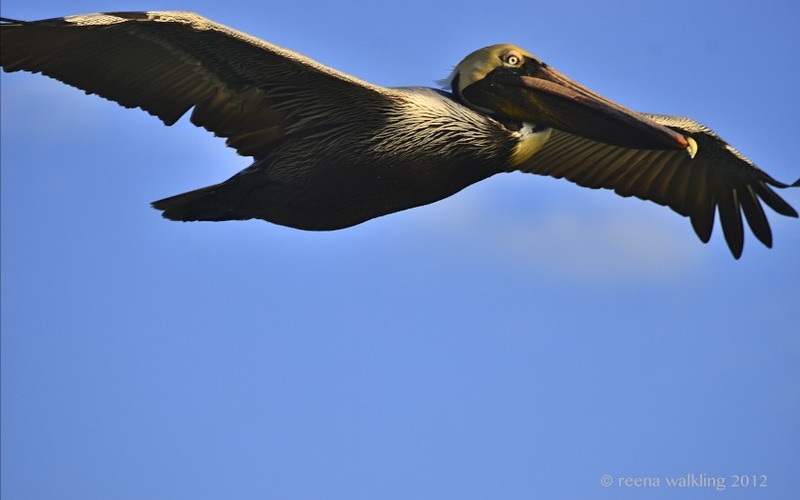 Reena, these are fantastic shots of the Pelicans. One of my favorite birds too, thanks for sharing. I have not tried many editing programs, which ones are the easiest to use, LOL! Great close ups, and you're right on the look. Is that the result of your new programs? Boom & Gary of the Vermilon River, Canada. Pelicans are in for treat, they are being a photographed by Reena. I love it. Oh I LOVE these. The crop in that first shot is absolute perfection! What a wing span on those pelicans. Great shots! You are a real photo editing mania. I love all your bird photos! They are always astounding! Well, I'm glad you went archive diving, because your pictures are once again, just stunning and inspirational! I hope your day has been an enjoyable one!! Wonderful pictures! They really show off the straightness of the wings in flight, almost like there is a board running through them. Oh, yes, like the others, I'm always delighted with your "archive diving"! I, too, am SO hooked on editing programs! 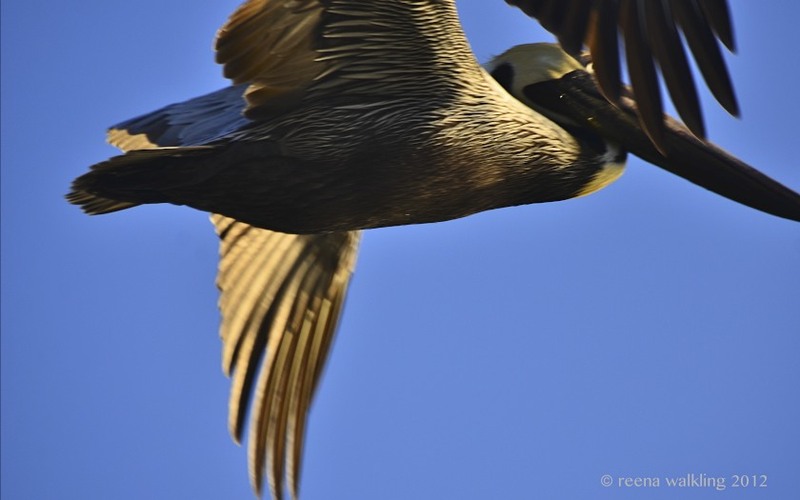 These are terrific captures, Reena, thanks so much for sharing these beautiful birds with us! Hope your week is going well! I love all of these! And I'm bookmarking those sites - thank you! You've got me thinking about pelicans, too. I hope I have time to go archive diving soon! They are such interesting creatures and your captures are so beautiful. Love those birds, and your photos are amazing. Photo Editing Anonymous - Ha, how about Photo Intense Editing PIE? crap...it was below 20 degrees here this morning! On to more pleasant things, such as your fabulous pelican images!!! Just amazing, Reena. I LOVE the eyes in the last photo, too. Watching those adorable pelicans take flight is such a magical moment for me. Hi there - very nice images. When I see terns (and waders for that matter) with band on, I wonder if they are one of 'my' birds! Went swimming this morning and it was still dark - hot damn, autumn is on the way!!! I've been playing with other photo editing programs constantly, it seems. With the impending death of Picnik, I find I'm trying everything! 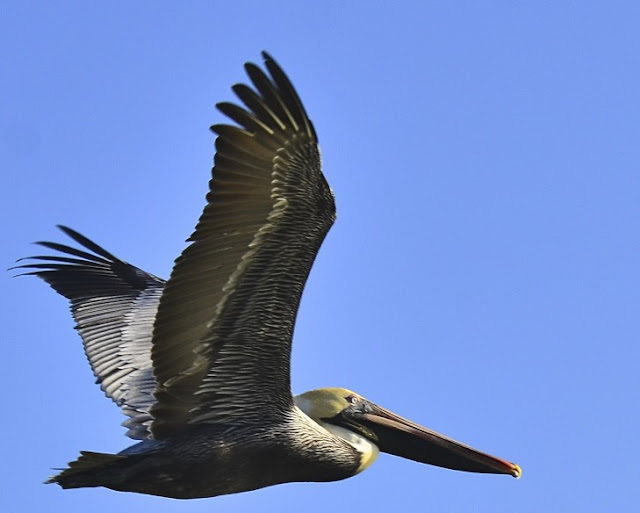 I love those Pelicans and you got some great shots! Terrific details, Reena. Love them straight out of the camera! Fantastic looking bird, and great shots. wowza....your editing on that first one is gorgeous!!! And another wowza to all the detail you captured in the others! awesome pelican shots even without the software addiction. i like the first one, call it pieces of pelican. I agree that the look on this birds face is cartoonish but the rest is sheer poetry. I miss them too. I'm testing software since Picnik is killing me by closing down in April. ::sob:: Wishing I used a mac right about now. I first started using Snapseed on my iPad and now that I have a Mac use it there too. It is one of my favorites apps. If it I could resize my photos with it then it would be perfect. I always enjoy reading your posts because I am a bit of an appaholic myself. That and your photos are always lovely. amazing! really amazing! i have never seen one in flight. Those are some neat looking birds. It's a fabulous bird, and your photos are lovely! that pelican eye and face is ridiculously sharp. You have a lovely touch with your processing Reena. Personally I get away with picasa and photoshop elements. I think I would get lost, never to return with lightroom or the big photoshop. Expensive investment there. 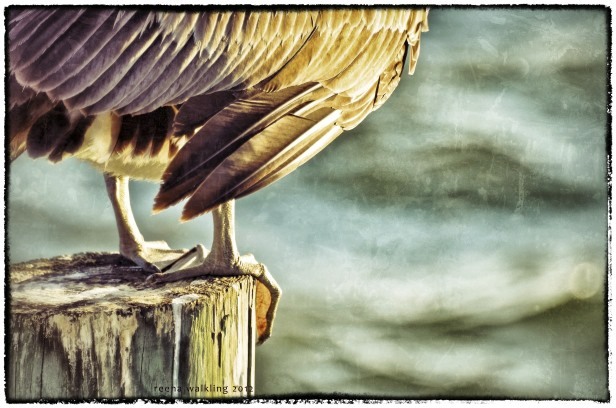 Wonderful pictures of pelicans. Those effects are pretty amazing too. Wonderful photos. That blue is such a stunning colour.